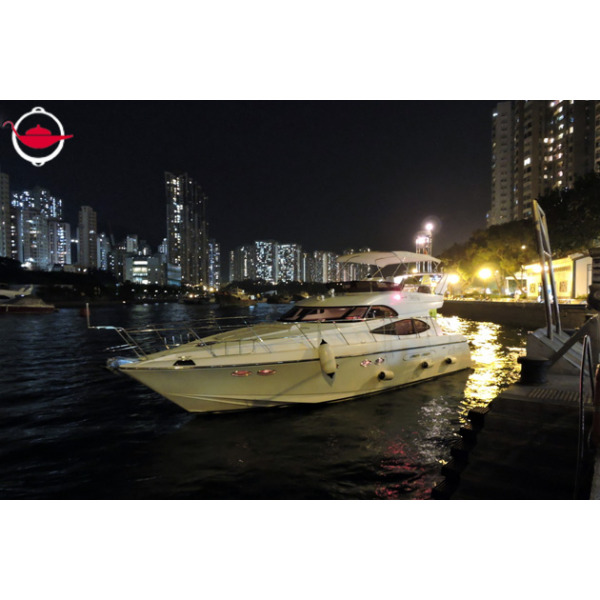 Whisk your sweetheart away on a luxury yacht with this 3-hour Romantic Hong Kong Dinner Cruise! This experience promises an unforgettable night of fine dining and sweet romance in the intimate setting of your very own luxury yacht. Whisk your sweetheart away on this 3-hour Romantic Hong Kong Dinner Cruise! This experience promises an unforgettable night of fine dining and sweet romance in the intimate setting of your very own luxury yacht. 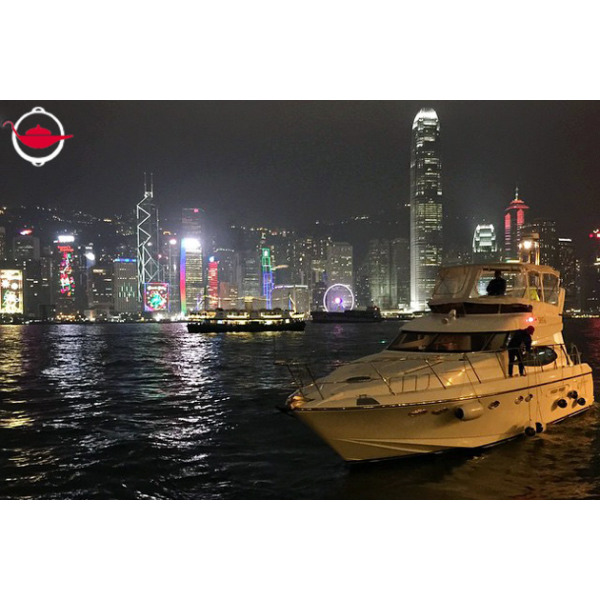 From the pier at Aberdeen, you and your other half will set off in a luxurious 48ft private yacht, cruising along Hong Kong’s southern shoreline. The yacht will be booked out exclusively for the two of you. On board, a beautiful bouquet of roses awaits as a lovely surprise. While dinner is being prepared, relax on the front deck with a glass of wine or sparkling wine and enjoy the soft breeze and magnificent views in complete privacy. 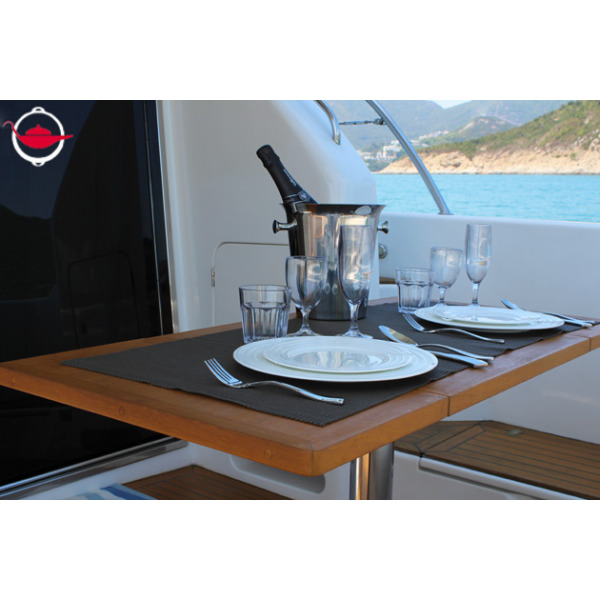 The yacht will take you to either Deep Water Bay or Repulse Bay, where dinner will be served. Moored within distance of the illuminated buildings and twinkling lights but away from the bustle, you will enjoy a romantic, candlelit 4 course dinner al fresco. Savour the calm and quiet of the open sea - just the two of you. All Mains Served with Sautéed Vegetables and Mashed Potatoes. Additional participants may join at an additional cost of $2000 per person, $1500 per child under age 12, up to a maximum of 6 people. Pick up and drop off at Aberdeen. 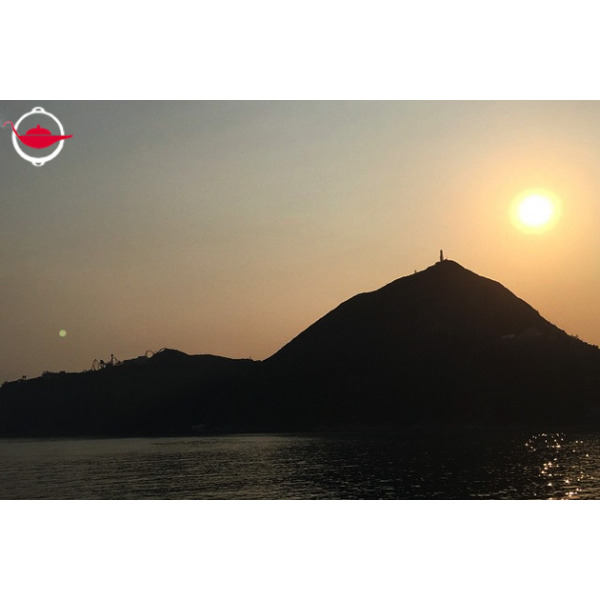 Pick up from or cruising to Stanley can be arranged at an additional cost of $1500; whereas pick up from or cruising to Central, Causeway Bay, or Tsim Sha Tsui can be arranged at an additional cost of $3500. This experience lasts for 3 hours, from 7:30 pm - 10:30 pm. Bookings can be made on Monday to Sunday. The earliest departure is 6:30pm, and the latest departure is 8:00pm. Bookings must be made at least 1 month in advance. Blackout dates apply: February 7 - 24, Mother's Day, Father's Day, December 24, December 25, December 31, and all nights with scheduled fireworks. Shoes will need to be taken off upon boarding the boat. This experience takes place out on the sea and is weather-dependent by nature. The Experience may be postponed or the sailing route altered in the event that the Hong Kong Observatory issues a Black Rainstorm warning or a Typhoon signal No. 3 or higher. If the experience has to be cancelled, you will be informed at least 3 hours before the experience begins. The menu can be catered to different dietary requirements. Please inform us of any dietary restrictions upon booking. Q: Can I choose to sail from other locations instead? A: Pick up from Stanley can be arranged at an additional cost of $1500, you will moor at Deep Water Bay, Repulse Bay or Stanley for dinner. Or pick up from Central, Causeway Bay or Tsim Sha Tsui can also be arranged at an additional cost of $3500, you will moor at the Old Airport Typhoon Shelter for dinner. Q: Will I be able to watch the sunset? A: Sunset times in Hong Kong depend on the time of the year. It generally ranges from 5.30pm (Winter) to 7.30pm (Summer). Q: Can the menu be catered to different dietary requirements? A: Yes, each participant may choose an appetizer and main course that fits their dietary requirements. We recommend the Creamy Garlic Truffle Parmesan Macaroni and Cheese for vegetarians. If you have other dietary restrictions, please inform us upon booking and we can prepare an alternative menu for you to choose from. That was a nice experience that I proposed to my girlfriend. The staff was so helpful who actively helped us to take photos and video taking etc. The dinner was nice. 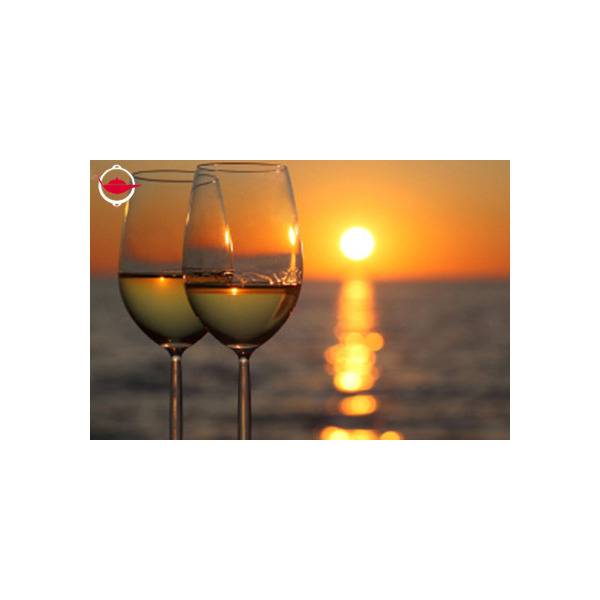 It was a romantic experience that very suitable for couple. The crew is very friendly and helpful! The boat was already at the pier waiting for us when we arrived 10 minutes earlier. They are very friendly, helpful and attentive. All our special requests are fulfilled in the journey. The boat is well maintained and very very clean. Food quality is fine we understand the kitchen on a boat is not a full kitchen. Overall very nice experience. We wish the journey could be longer. The boat was a good size and well maintained, the owner very nice, and the food simple but very nicely presented and tasty. It was a great experience. It was wife's birthday celebration and she absolutely loved it. The crew were fantastic and non-intrusive..the weather was pleasant and the clouds gave away to reveal the stars..
We made a reservation through Spoilt for a private dinner cruise buffet party (for 6 pax) to celebrate my parents' 35th Anniversary. The experience was amazing. Boat was a great size for a small/ cozy party (and very clean!!!). Staff were extremely attentive and polite - amazing service. Food was cooked by Jenny, who's in charge of the boat, and tasted very yummy. Will definitely do this again and will strongly recommend this experience for a small get together! I came across this opportunity by browsing internet to see if I could offer something special and memorable to my girlfriend on her birthday. I just followed the booking and settlement process, which was very easy and efficient and off we went. My gf was speechless as it was a surprise and she was not aware of what we were doing...which means I achieved the purpose!